What an amazing day this past Friday at Cedar Lake, Cedar Lake Lodge, Cedar Lake Enrichment Center and Park Place Residence near Louisville, Kentucky!! 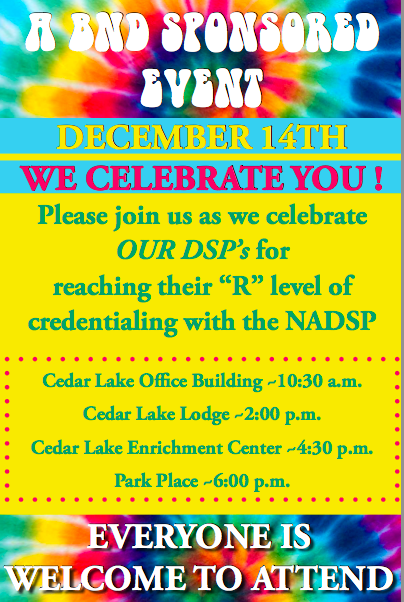 Joe Macbeth, Executive Director of NADSP, and I had the great honor and joy to be invited to the agency-wide celebration of certifying 110 DSP-Rs! DSP-R essentially means that the candidates have passed the requirements and petitioned the NADSP and have qualified for registry in a national data base. DSP-Rs are recognized as being in the initial qualification stage for national credentialing. 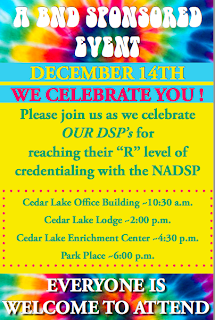 Cedar Lake has committed to transforming the majority of it's front-line direct support workforce into fully nationally credentialed professionals with the DSP-C within 5 years. Amazing goal!! Cedar Lake began this wonderful journey towards a DSP-centric culture on August 2, 2012, at the Brand New Day Gala!....heretofore referred to as BND (I was not blogging then but may just devote a retrospective blog entry about that day in the near future...stay tuned) During the BND event last August every stakeholder in the Cedar Lake family committed to a 5 year plan to educate, remunerate and register and credential as many their Direct Support Professionals as possible. This was such a celebratory day and was indeed the opening ceremony for what is to be a powerful journey towards excellence. We were there that hot August day and we have watched carefully over the last four months as the leadership of this organization and the staff at Cedar Lake are fast becoming a shining beacon for similar organizations in the country to follow and aspire to become. Cedar Lake is steadfast and on a clear path to becoming a true national leader in supports and services for people with intellectual and developmental disabilities with the emphasis on their Direct Support Professionals as being the primary vehicle for assisting the people supported in achieving abundant life and abundant possibilities in life. Chris Stevenson, President and CEO, of Cedar Lake has been the heart and soul of this agency transformation and has clearly committed dollars and "sense" to make Cedar Lake the absolute pioneer in promoting competent and ethical Direct Support Professionals to the top of the organizational chart. We see Cedar Lake and it's fine leadership as an example and model for a national shift into promoting organizational DSP-Centric culture and focus.This can only be done strategically and with LOTS of focus on the right people leading. Patrick Varner, Cedar Lake's Community Engagement Coordinator, is Cedar Lake's resident BND cheerleader and culture-maker. He is at the center of the agency transformation and is a person who infects you with hope, inspiration and BND mojo!! Ya gotta see this man in action...no words can describe him!! He is important to keep the spirit moving.
" It is an important moment for us all to be supporting so many staff in this transformative undertaking, and we are looking forward to carrying on the work to build more steps in the career ladder. Most of all, the day served to reinforce the importance of the services that our DSPs provide to our residents, the full support of the organization, and everyone’s commitment to building a career based upon a firm foundation of our values." Janet Wilson, DSP-R ....Yes, Janet is a DSP-R!! The most important people at Cedar Lake will always be the people supported. With DSP-R and DSP-C staff by their side the mission of the organization will blossom, and life will be abundant for everyone in the Cedar Lake family. they deserve to be listed here!!!! Congratulations everyone what a fantastic achievement.